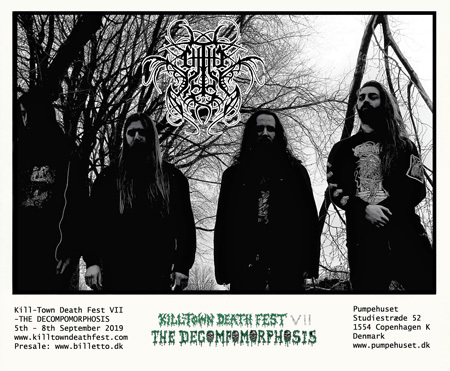 Killtown Death Fest » Announcement #25: first ever and exclusive one-off European performance of CHTHE’ILIST (can)!!! Announcement #25: first ever and exclusive one-off European performance of CHTHE’ILIST (can)!!! We are sorry about the missing announcement yesterday. One too many margaritas might be to blame… Anywho today we are back with a vengeance and have a strong announcement for you. Turning our focus back to Canada and this time to Montreal, we areexcited to be able to present the first ever and exclusive one-off European performance of CHTHE’ILIST!!! French Canadian Death Metal band Chthe’ilist was founded in 2010 by vocalist/guitarist/bassist Phil Tougas (see also : Funebrarum, Zealotry, Atramentus, Eternity’s End, Cosmic Atrophy, etc) and drummer Philippe “Tyrant” Boucher. Originally formed under the moniker “Phantasmal”, Tougas instead opted to create a new word out of unusual phonetics to name his aberrant creation, because according to him, “the music of unspeakable horrors should not have a plain human word for a name”. The band recorded their first demo “Amechth’ntaas’m’rriachth” in 2011, which was self-released in 2012 and re-released in 2013 by Graceless Recordings. 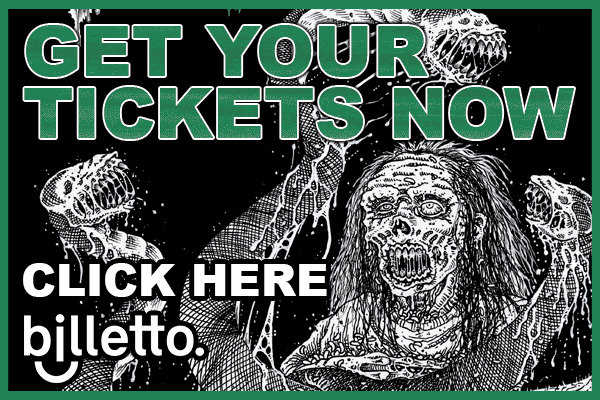 The now sold-out and highly sought-after cassette made the band stick out like a sore (and rotten) thumb in the Montreal metal scene, helping them gain an extremely passionate fanbase overnight and playing various festivals and rare one-off gigs around the country. Chthe’ilist signed with Profound Lore Records a few years later to release their debut album “Le Dernier Crépuscule” in 2016 and a 7″ EP titled “Passage Into The Xexanotth” in 2018, both causing an enormous stir in the underground. With its thick, otherworldly atmosphere and sickening sonic textures evoking images of abandoned medieval castles inhabited by indescribable, grotesque creatures, combined with dungeon-like, epic-doom tinged sections and shredding solos breaking up the continuous onslaught of eldritch, slime-drenched riffing, complemented with high-precision musicianship, Chthe’ilist’s music tell the tales of unspeakable horrors in an alternate timeline where mankind has fallen back into the medieval dark ages, living on the verge of extinction and in the constant dread of wrathful deities and the unknown entities that lurk in the shadows of ancient towers and spectral realms. From the disgusting, viscous throat-rattling sounds vomited forth by Phil Tougas, to the neoclassical guitar solo duels reminiscent of the Shrapnel Records guitar heroes of old, the outrageous tentacular slap-bass lines and their excentric mix of influences, the band’s sound showcases just the right amount of flashiness and eclecticism through an aura of bitterness, foreboding doom, decay and horror. Chthe’ilist is currently writing music for a 2nd album, with no intentions to rush it.